The auditorium is filling up with Chilean „calmness“. It is already ten past ten (awefully late for a German), but time has another meaning in Chile. Everybody takes his time to share pecks, hugs or smiles. Eventually everybody finds a seat and the Summer University can start. Dr. Joachim Borner, Scientific Director of the Kolleg fuer Management und Gestaltung nachhaltiger Entwicklung, has the honor to open the 9th version of the International Summer University. 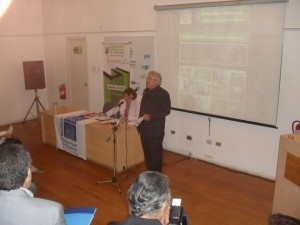 „Again an old man who opens an event“ he says, but Señor Borner radiates energy, vigor, motivation and a certain freshness, I haven´t seen during my university experience. He is introducing a topic so old, yet important now and for the future, in such an easy, cool and a little comedically way, that everybody in the room seems to hang on his lips. The economic crisis, climate change, demographical developement, the gap between rich and poor and the arabic spring have shown that our current, „very old“ systems and structures are not sufficient enough or in other words that they doesn´t work at all. Joachim Borner describes, that during this university we will try to find new metaphors, new stories, new ideas and maybe a new manual for the rocket, that will take us hopefully on a sustainable way. The goal is to create a story, using spots, vod- and podcast, articles and pictures. Transmediastorytelling via Storyfi (example of 2011) is the magical word, which catches the hearts of the generation 2.0. The speech of Joachim Borner was moving and encouraged me in my opinion, that this is the right place to find my answers and ideas. Dieser Beitrag wurde unter 2012 | Chile, All, English veröffentlicht. Setze ein Lesezeichen auf den Permalink.